Everything's a-buzz with Tall Ships this week in Halifax. Seems like a good time to highlight some of the excellent Sea Stories featuring historical adventure that you can find in the library collection. Many of these novels are the first in a series - if you like one, you should try them all! The Blighted Cliffs by Edwin Thomas (first in The Reluctant Adventures of Martin Jerrold): high seas adventure with a mysterious twist. In this series opener, Lt. Martin Jerrold has been sent to work a less-than plum assignment after his poor performance at the Battle of Trafalgar. When he finds a body on a beach, he has to work to find the killer, so that he himself isn't blamed. 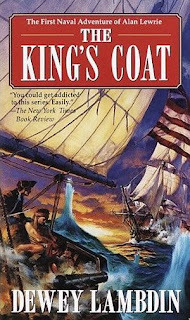 The King's Coat by Dewey Lambdin (first in the Alan Lewrie Naval Adventure series): In late 18th century London, scandal leads Alan Lewrie into the Royal Navy. This well known series began in the late 1980s and has followed Lewrie though 15 adventures thus far. Adventure, and a usually a few shenanigans on the part of the young lead, have made this series a favourite. The Guardship by James L. Nelson (first in the Brethren of the Coast trilogy): This first title in a rollicking series has plot to spare. Publishers Weekly summed it up thusly: "In 1701 Virginia, Thomas Marlowe kills a favorite son of the colony's most powerful tobacco family, the Wilkensons, in a duel, incurring the wrath of the entire clan. 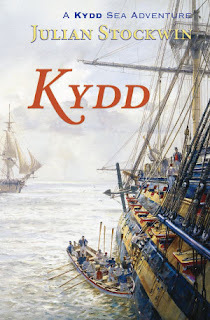 Soon after, when he's given command of the colony's guardship Plymouth Prize, Marlowe must deal with the Wilkensons' vendetta, the Prize's decrepitude and inept crew, and his fascination with beautiful widow Elizabeth Tinling (whose honor precipitated the duel), before getting around to his main job, fighting Chesapeake Bay pirates ..."
Kydd by Julian Stockwin (first in the Kydd Sea Adventures series): the new kid on the block (pardon the horrible pun), Stockwin's books have all been written since 2000 and are a welcome edition to a genre that for awhile wasn't seeing a lot new being produced. The series' hero, Thomas Kydd is rounded up by a Press Gang and becomes a soldier in the Royal Navy. Master and Commander by Patrick O'Brien (first in the Aubrey/Maturin series): you've likely seen the film starring Russel Crowe, but the long running book series is a must for any fan of high seas tales. This is one of classics of historical high seas adventure and the series runs 20 volumes. The Private Revolution of Geoffrey Frost by J.E. Fender (first in the Geoffrey Frost series): an American series set in and around the American revolution. Richard Bolitho, Midshipman by Alexander Kent (first in the Richard Bolitho novels): another long series that follows the career of Richard Bolitho as he moves through the ranks of sailors, beginning as a midshipman and rising to Admiral.